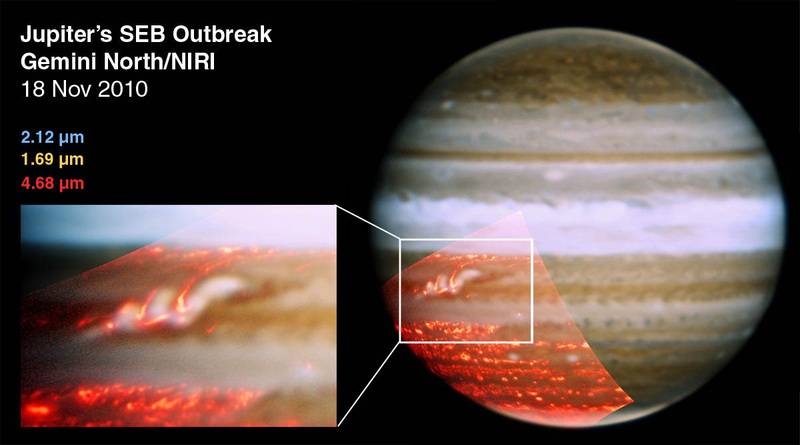 Explanation: Why are planet-circling clouds disappearing and reappearing on Jupiter? Although the ultimate cause remains unknown, planetary meteorologists are beginning to better understand what is happening. Earlier this year, unexpectedly, Jupiter's dark Southern Equatorial Belt (SEB) disappeared. The changes were first noted by amateurs dedicated to watching Jupiter full time. The South Equatorial Band has been seen to change colors before, although the change has never been recorded in such detail. Detailed professional observations revealed that high-flying light-colored ammonia-based clouds formed over the planet-circling dark belt. Now those light clouds are dissipating, again unveiling the lower dark clouds. Pictured above two weeks ago, far infrared images -- depicted in false-color red -- show a powerful storm system active above the returning dark belt. Continued observations of Jupiter's current cloud opera, and our understanding of it, is sure to continue.